Over on EN World, while digging through the old (now combined) threads of the ongoing Q&A with Gary Gygax, I stumbled across something I either missed or had forgotten regarding the use of the d20 in D&D. "As to the d20 for use in combat, we had used a 5% incrimental system for hit determination in an earlier work, the TRACTICS rules. 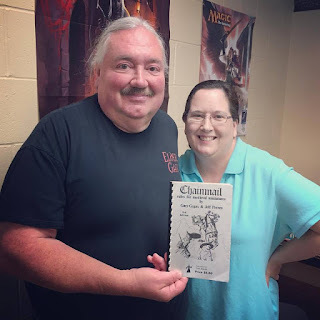 thus it was natural for me to utilize the same easy system for the D&D game even as I used all the other dice for other aspects of the game." (Tractics "was published by Guidon Games in 1971 and republished by TSR, Inc. in 1975." - Wikipedia) You can read more of Gary's insights dating from August of 2002 until his passing in March of 2008 here and this specific quote here. Also, on Amazon.com, check out the going rate of 1985's Castle Thrax by Paul Burdick (Author) and Dave Billman (Illustrator) from Spellbinders Games. It's a level 4th-5th adventure designed to be used with the 1E AD&D system but without a Dungeon Master. See more here. Finally, I have to say that the list of retroclones gaming systems over on Taxidermic Owlbear is the most extensive and comprehensive list I have yet seen. Bookmark it here.